A good friend gave me this recipe in college and I have since tweaked it and made these cookies a couple hundred times. 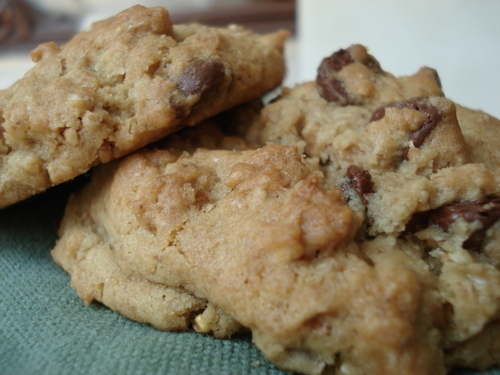 Like our favorite pizza (more on that later) we make this chocolate chip cookie almost once a week. My husband gets nervous when we run out of an ingredient for these cookies so we tend to always have the stuff to make them in the house. This is the type of recipe you should, like a great pair of jeans, always have on hand--to turn to for comfort, or in a pinch, or just because you feel a little more relaxed knowing they're in your "closet." The good news is you don't have to pay 2 hundy for a pair of these cookies. In a mixer cream the butter and sugar. Add the egg, then the vanilla. In a separate bowl stir together the flour, baking soda and salt. Add slowly to the wet ingredients until mixed together. Stir in the chocolate chips and cereal. Bake on a cookie sheet (or pizza stone if you have one) for 9 min.